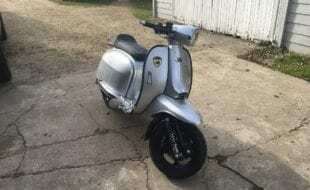 One-owner scooters are seemingly coming out of the woodwork at an ever increasing rate, some having seen constant use, others having laid dormant until a spark of interest rekindles a dwindled interest. 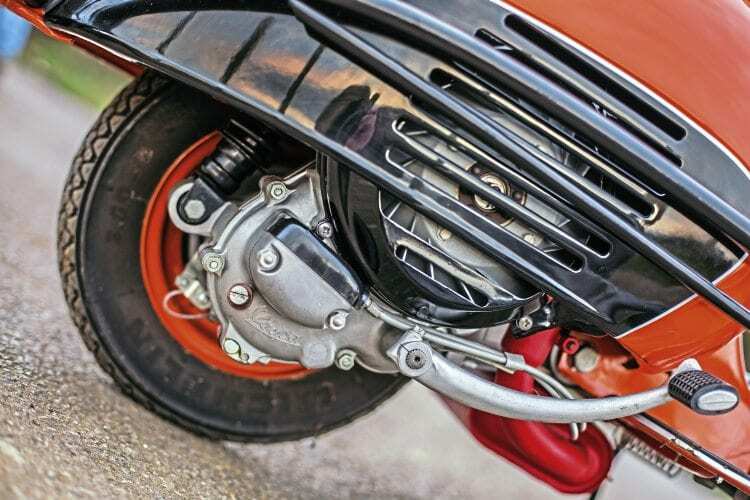 The 1959 GL150 you see before you is one of the latter sort, having been in cold storage since the late Sixties, and recently brought back to life almost exactly as it was when it was last ridden in anger. 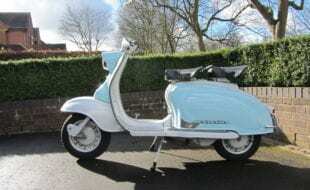 Roy Petitt bought this scooter in October 1959 from Knights of South Harrow. He was chomping at the bit back then to get the machine, and is still as enthusiastic about it today. When he bought the scooter, 715 WMV, he already had shares in a car which he’d bought with his parents, but being a young man of the time, needed transport of his own when this wasn’t available. As was often the case with that generation, scooters caught his eye, this one was found and the deal was done, Roy riding it home a happy man. 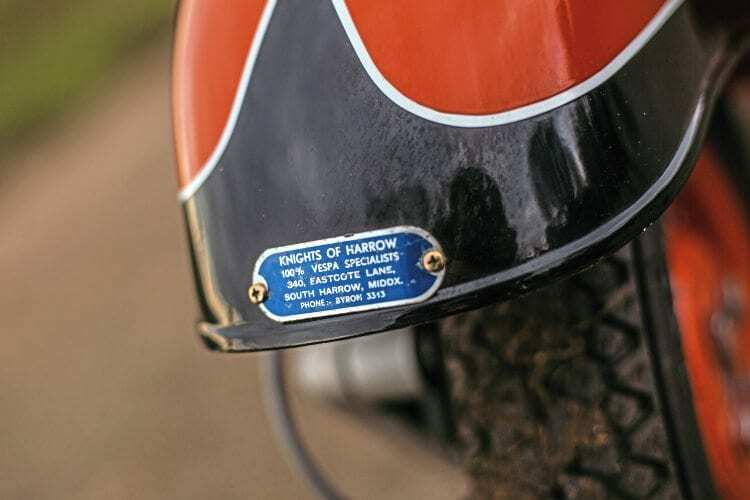 Within a year, he was a member of the local Vespa club, Harrow. An active club, they organised a variety of social events, as was the norm in those days, from barbecues (Roy can’t recall how they managed to transport that on scooters, but is sure that they did!) to pub rides where they’d meet for an early pint or two before heading out into the countryside. Now there’s something you can’t even begin to imagine doing these days! 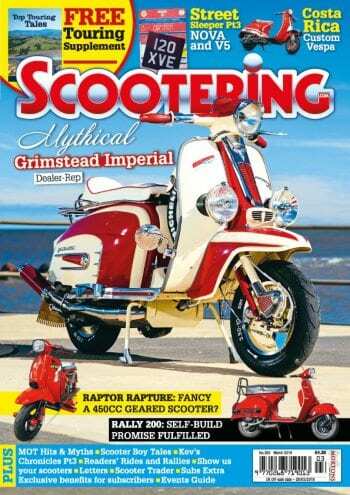 He remembers that his first experience of a Vespa rally was at Harringay Stadium in either 1960 or ‘61. He doesn’t remember a great deal about it, spending the day suffering with heatstroke. That’s not a common occurrence on a British rally, is it? His club were also experienced European visitors, taking in expeditions to France, Holland, Norway and Denmark among the many countries they saw. Admittedly, they didn’t ride all the way, but would normally get to France and then hire a van to get to their destination. In some respects, I suppose that this goes to show that there really is nothing new under the sun… It was during one of these trips abroad that he met his wife to be. They had space in their van for people from outside the club, and she tagged along for the ride. The rest is, as they say, history. One of their more memorable moments was on a trip to the former Yugoslavia where they arrived late at their hostel. Despite pleading to be allowed in, they ended up having to sleep outside, near their transport. Given the state of that nation at the time, they were naturally worried about getting lifted for loitering, but thankfully it never came to it. Imagine trying to explain that one to the polis. They also flew into Le Havre on one of the old Bristol Freighters with the nose that opened to load. On arrival, they had sherry at a mayoral reception before proceeding on to a brewery where more alcohol was imbibed. Needless to say, by the end of the day, they were largely the worse for wear and pretty much incapable of riding. It was on this weekend that Roy discovered that you could fit quite a reasonable amount of beer into a GL panel. Unfortunately he forgot about it as he went through customs. They were quite strict about the amount you could transport, but luckily he wasn’t stopped! The club also reciprocated, hosting travelling Vespa owners from around Europe who were seeing the UK. One memorable couple were from Austria who were seeing Britain as a part of their honeymoon, with the Petitts segregating their house to give the newlyweds a bit of appropriate privacy. 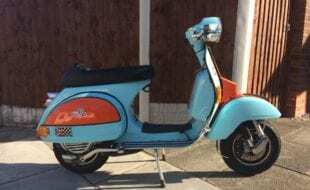 Roy recalls that they stayed a few days before moving on to stay with other Vespa owners. You can’t help but feel that the world would be a happier place if there were more of this still happening. 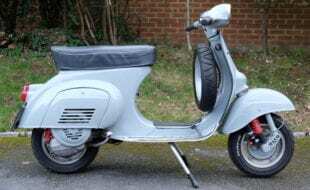 As time went on, the scooter got used less and less with the expanding family meaning that the usual purchase of a car was in order, and the GL ended up being pushed to the back of the garage where it sat for 30 years, surviving at least one house move and the boom in second hand scooter sales of the early Eighties. Time rolled by and Roy’s eldest son, Justin, took an interest in the family heirloom sitting at the back of the garage. He understood how much the machine had meant to his dad, and decided that it was time to revamp the old lady. The bodywork and paint had got a bit tired during its time in storage, but overall it seemed to be in good condition. Atoms Scooters in Maidstone were approached to undertake the renewal, with the working brief that it was to be as faithful to the original as possible. 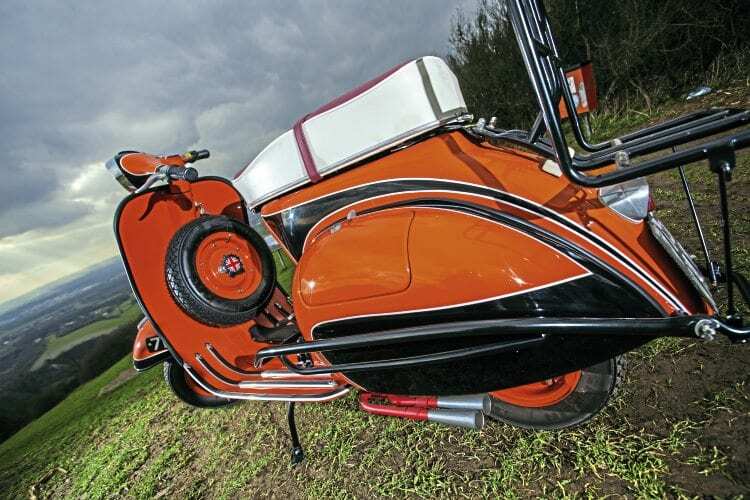 They leapt at the chance to revive a great example of a true Sixties scooter, and set to work on it. After blasting the frame, they were surprised at how generally good the scooter’s condition was. It was so good in fact that pretty much all that needed replacing were the headlamp inner, the floor strips and the grips. Even most of the fasteners that currently hold the scooter together are the ones that originally came off the machine, they have just been re-plated. It’s THAT original. A couple of small rust holes were repaired, and a few small dents were carefully knocked out, but that was about all that needed doing before it could be prepped for paint. Luckily, in the dismantling stage, a small patch of original and unfaded paint was discovered under the fuel tank which gave a base for matching the colours. Once successfully matched, the base paint was applied and the contrasting flashes carefully reproduced. 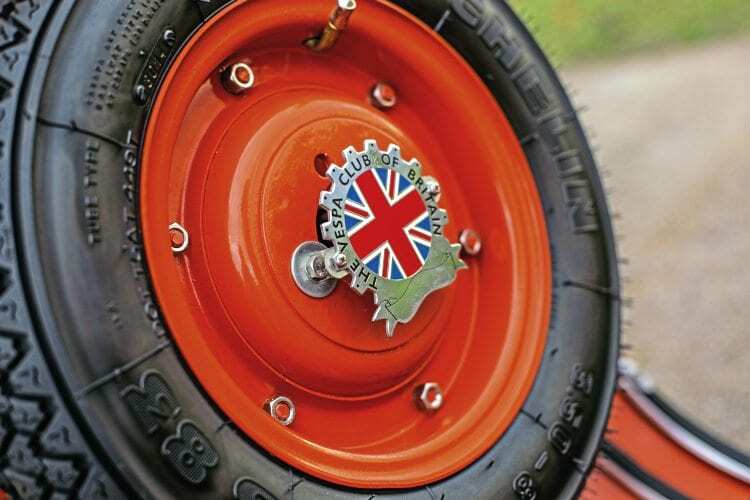 The only variation from the original paint was the pinstriping which separates the two main colours, something that brings the paint forward to the modern day, but still retains its original feel. All the parts that would originally have been electroplated were cleaned and re-chromed, with the exception of the light switch, which Atoms and Justin agreed actually looked better in the worn copper plate, and also was a nod to the age of the machine. Meanwhile, the engine was being giver a complete overhaul. The casings were vapour blasted and the seals and bearings replaced, and all internals checked for condition and tolerances. Much to Atoms’ surprise — and no doubt relief – almost all the internals were reusable, meaning that the engine is pretty much built from entirely original components. 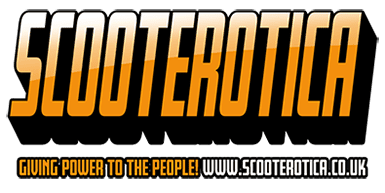 There can’t be that many scooters around today that are still running their original Sixties engine parts, can there? It’s not just the internals either. 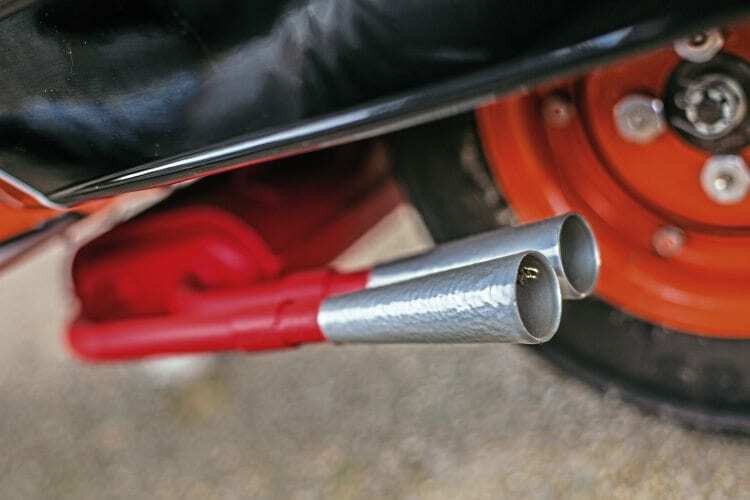 See that gorgeous Ken Cobbing copy exhaust? It isn’t. It’s a genuine, original, barely touched (though obviously repainted and plated) item. Rocking horse poo, it doesn’t come much rarer than that. 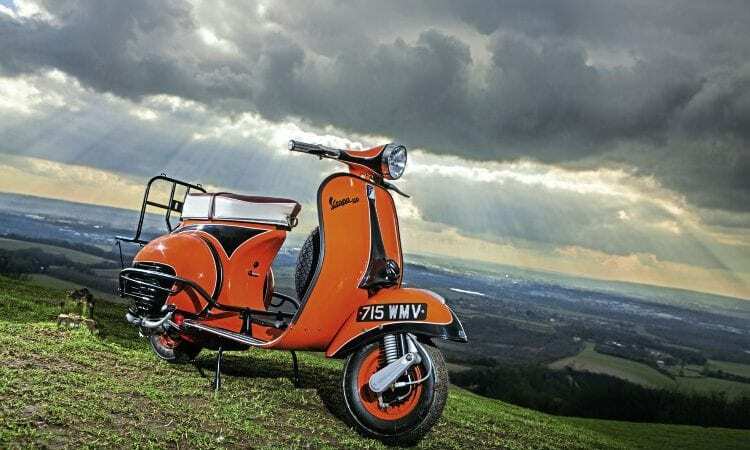 It’s fair to say that the Vespa GL is probably one of the more overlooked models from Vespa, co-existing as it did with the legendary GS series. It remains an important model in its own right, straddling the transition from the relatively plain VBB and its more modern looking descendants across its various incarnations. 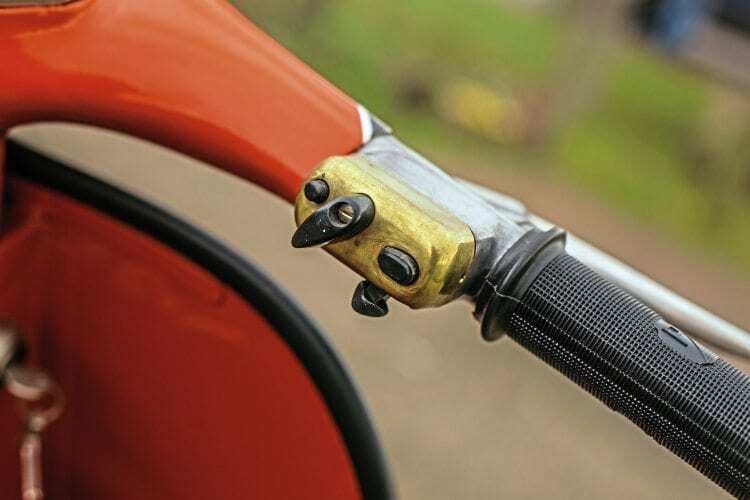 The machine was designed to fill the original niche that such scooters were intended for back in the immediate postwar years, an affordable means of transport for the working man. Perhaps not as glamorous or well-loved as the GS, but still a great scooter in its own right. 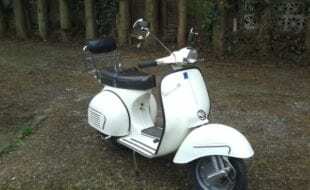 Improvements over the previous models were typical of Piaggio at that time, small but solid increments paving the long road that led ultimately to the P Range which lasted until very recently. 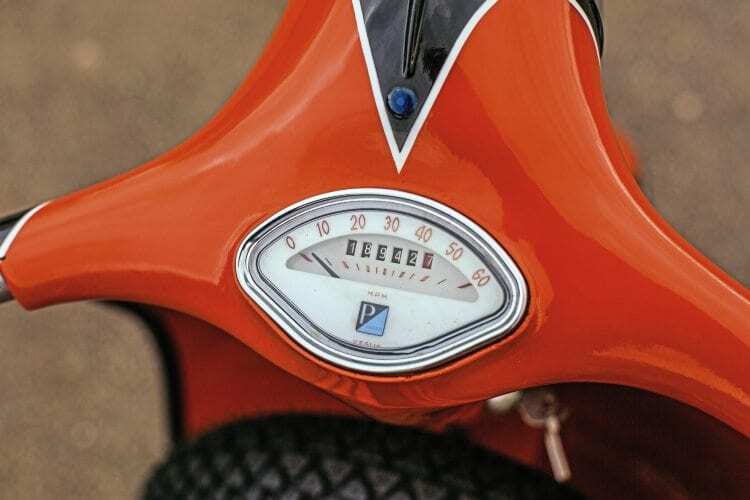 The first model of Piaggio GL (French licensee ACMA had made a scooter of this name earlier, but it wasn’t related to the Vespa series, using oddball 9in wheels) was launched in 1957. It was based on the VBB chassis, and managed to squeeze 10in wheels and an improved engine into a chassis designed for the older 8in ones. This version — the VGL1T — lasted only a year or so before being superseded by the VGLA1T which ran from 1959 until 1962. 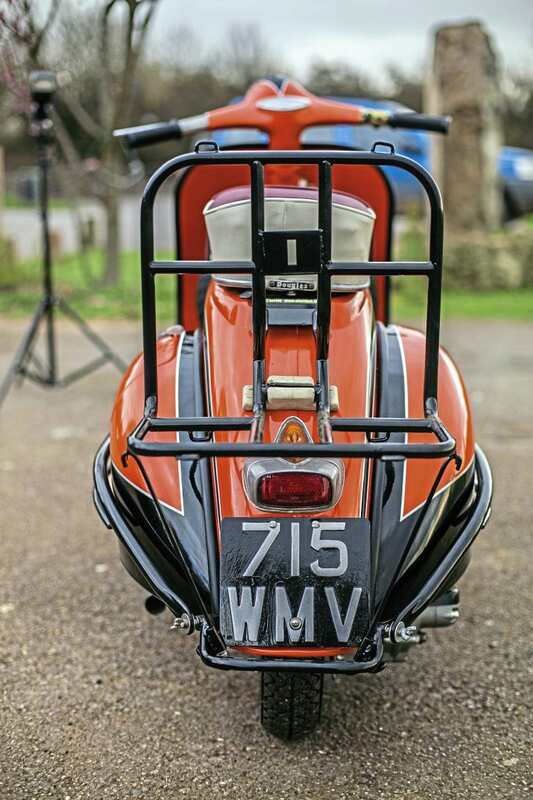 The newer model was a more angular shape, and was the first to use the level seat area chassis top that gives the classic silhouette that we recognise to this day. The third, and final, variant is the one most people think of when they talk about the GC. The VLA1T introduced the trapezoidal headlamp, panels with a slightly flattened top edge and undoubtedly paved the way for the styling of the later SS, Rally and Super models. 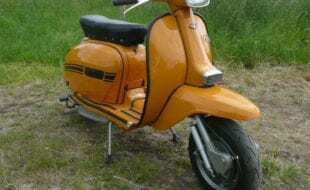 At the end of the third production run, Vespa had manufactured 79,855 examples of this oft overlooked scooter, a respectable two thirds of that of the more well-known GS series. 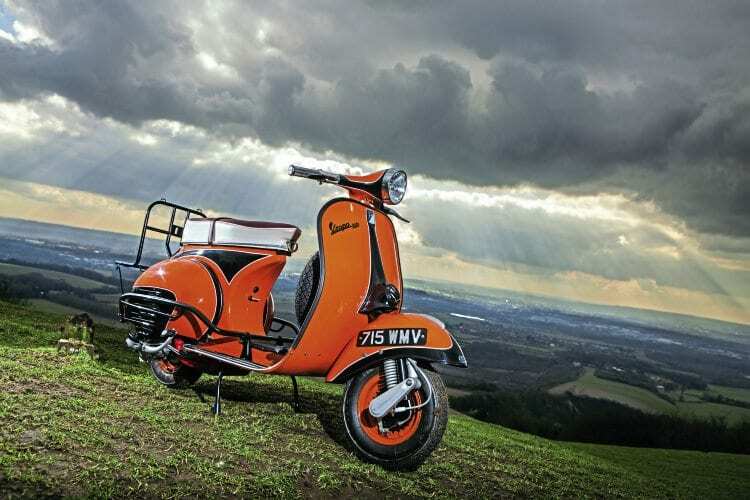 Previous Post:Scootering classics: Such a lightweight… The Ali-Bretta!